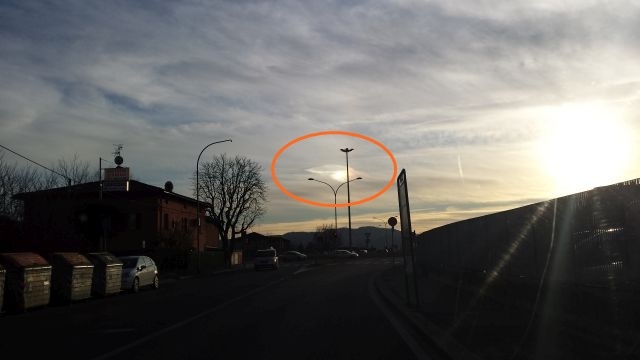 A UFO sighting reported to the Mutual UFO Network includes photos of what appear to be a strange cloud that looks like a flying saucer is spotted over Bologna, Italy on January 18, 2016. Witness report: I was on my way to work, driving towards a long straight road in Bologna, the city where I live, in Italy and while I was looking ahead on the traffic I saw brilliant light in the sky in front of me. The light was yellow/orange and seemed quite hot, just like a little sun; it was also surrounded by a beautiful little rainbow on its lower part. 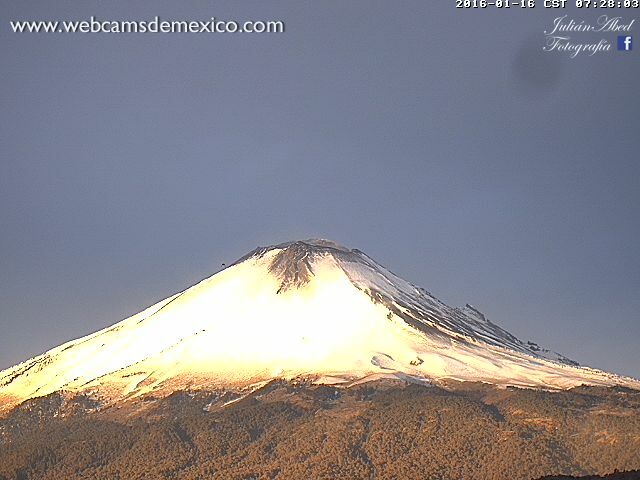 Although the day was quiet cloudy, the light and the rainbow were very clear in the sky. Right after this, I also noticed a huge disc-shaped object floating steady just on the left of the light. 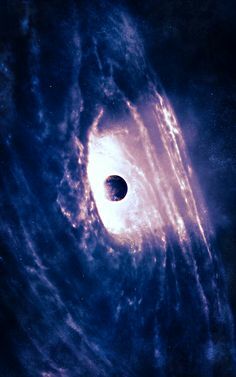 The ‘object’ seemed to me like disguised as a cloud; it was like a disc shaped cloud of a totally different color than its surroundings. It was light grey/silver/white, quite bright but the whole sky around was cloudy grey or clean. I wonder if there is something hidden in the cloud. 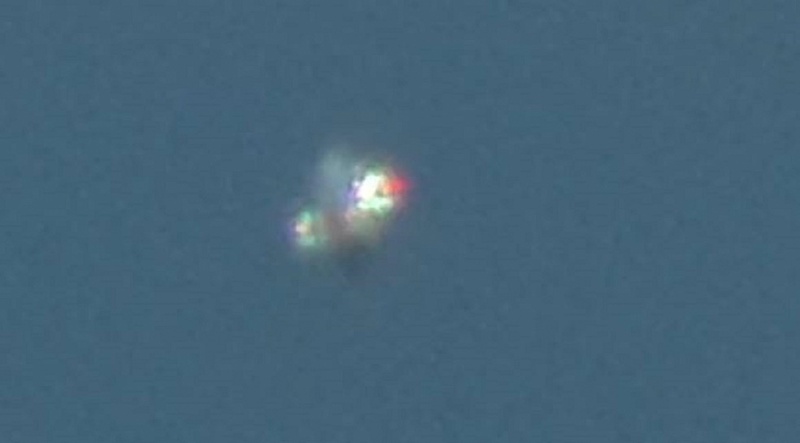 Mufon case 73961. 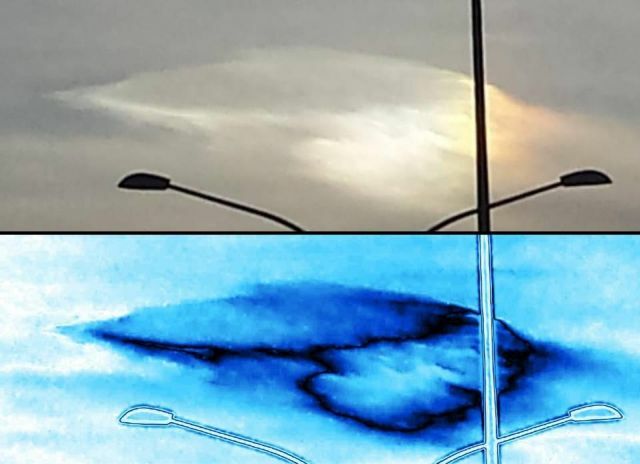 Note: There is strong evidence that UFOs do cloak themselves with clouds which they apparently generate. 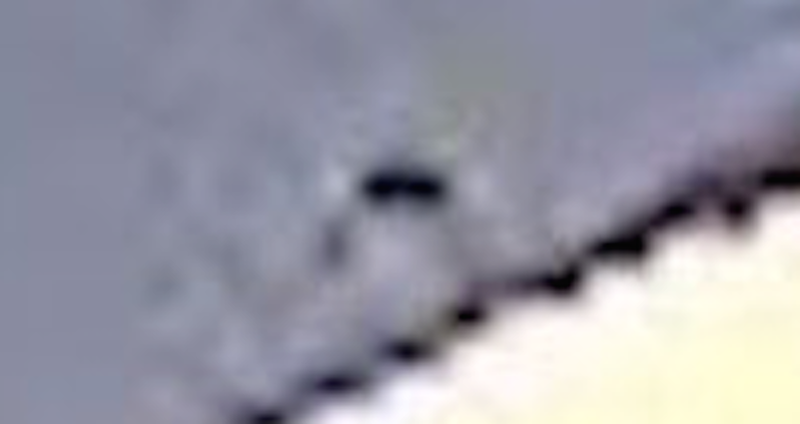 Did the witness photographed a cloaked UFO? 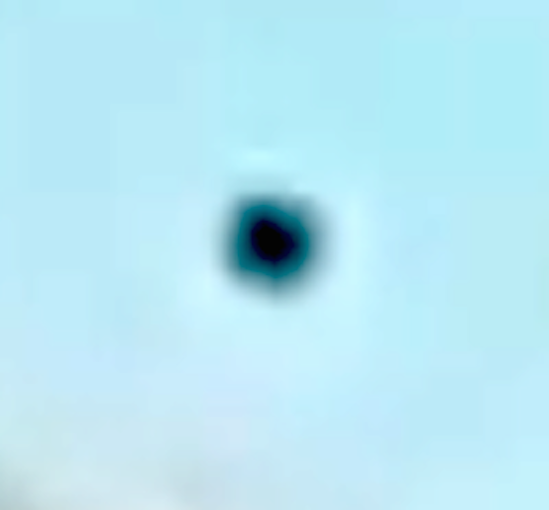 Description: At around 7.30pm on Friday night in Robina, QLD, a flying object hovered very slowly in one spot below the clouds, much lower than any plane or helicopter I have witnessed in the area. 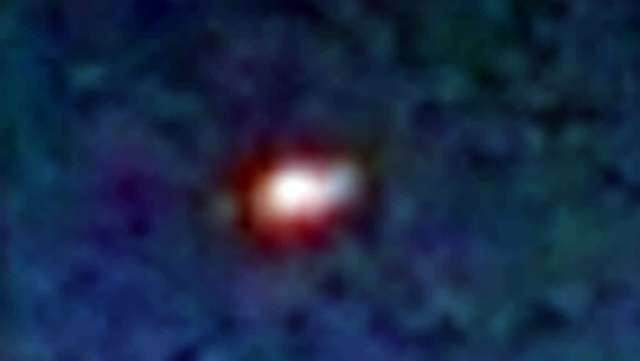 The two red lights at the base of the object faded to orange before flashing rapidly, object also appeared to be expanding then retracting its size repetitively before closing in completely and flying away extremely fast. The white ring or orb around the disc appeared to act as a bubble or light. The sighting lasted about 7 minutes and had 3 witnesses. We have previously had two sightings identical to this within the past two months from the same location. 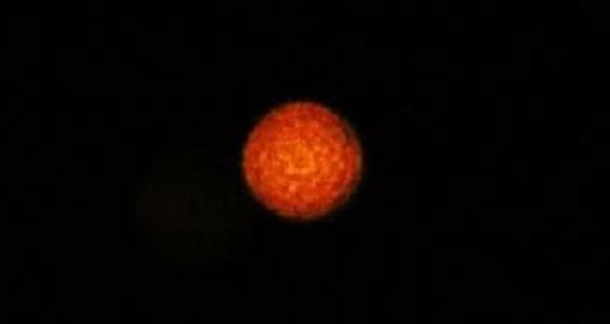 Description: Bright amber orange orb, occasionally with flecks of red. Moving from east to west at cloud level (occasionally it would be in front of clouds, then more behind as it moved west) It was able to accelerate quickly, to a speed many times faster than a plane would appear from the ground, then it would slow down quickly, then accelerate again. It eventually disappeared behind clouds to the west. 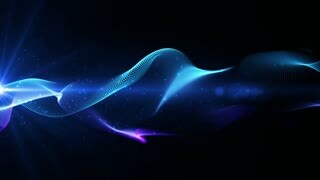 NOTE: The above image is a rendering. 10:52am. Looking out of my kitchen window I saw a shiny reflective craft just sitting in the sky in full sunshine. 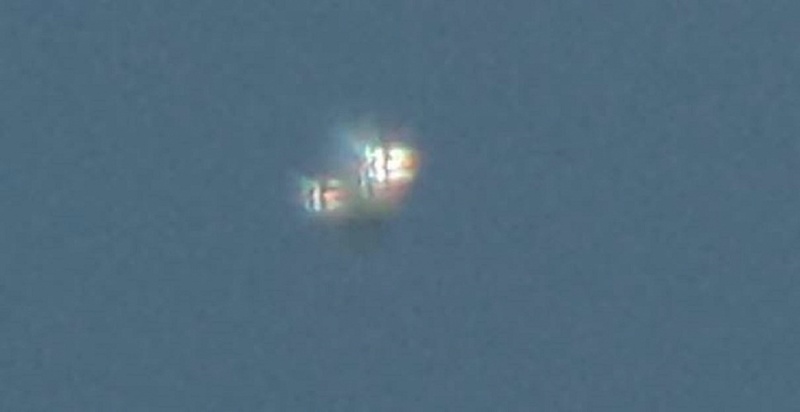 After a few minutes of observation of the craft with to sound or movement I went to fetch my Nikon Coolpix P520 camera. When I returned it was still there in the same spot. Now it was pretty high up near the clouds so my camera had difficulty focusing on the object. I took 5 pictures and 2 videos of the craft until about 11am when I felt I wasn’t getting any quality pictures or footage so I stopped to feed my crying baby. What?! You see a bleeping UFO and you walk away? Yup. So alas I didn’t get to see it move or leave, but it was gone after I fed my baby and went back to see if it was still there. 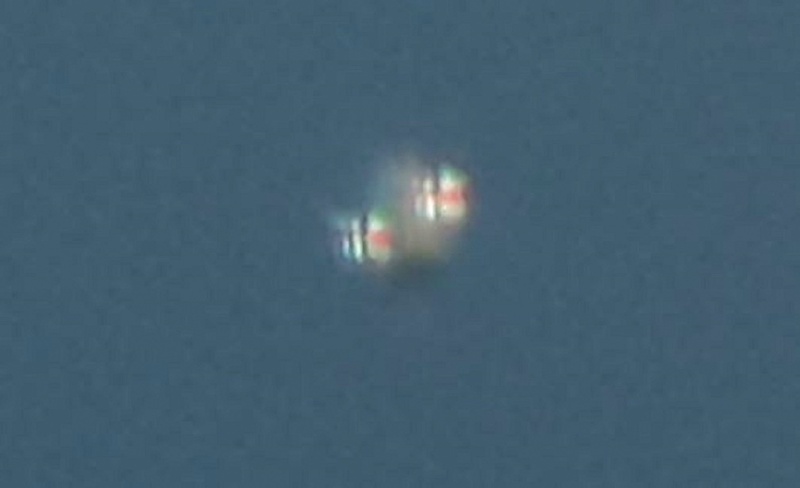 My better UFO video is on YouTube titled “UFO over Florence” and if you’re real quick with the pause/play button you can see the craft briefly at two points during the video where it comes into focus. 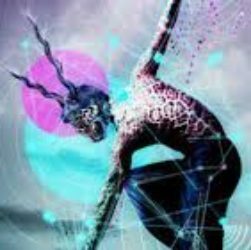 Now the reason I’m reporting this to MUFON is because I just watched a show about the mass sightings in Bucks County, PA which is directly across the Delaware River from me and nobody had any pictures or videos to share. 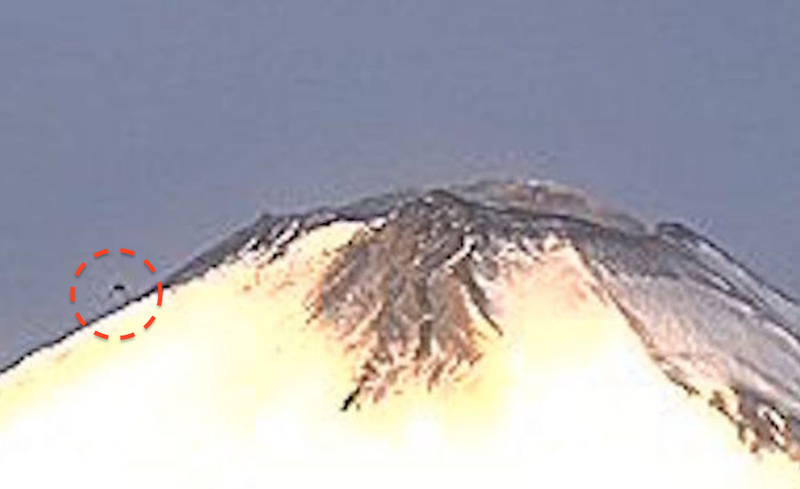 The location of the object is also where birds are often seen circling, riding the updrafts which are always present, probably from the nearby river? Which got me thinking about the landfill in Tully-town (Bucks County, PA) right on the Delaware River, which is a half mile away. Maybe the craft was interested in the landfill? There is currently a lawsuit against Waste Management of Pennsylvania regarding noxious odors, etcetera, from their handling the site. I would also like to point out that Military planes from Joint base McGuire-Dix often do training flights in the area and my home is in between flights coming and going from Newark & NY airports. I didn’t see any planes heading west during my observation so maybe they were directed away from their normal flight paths.? 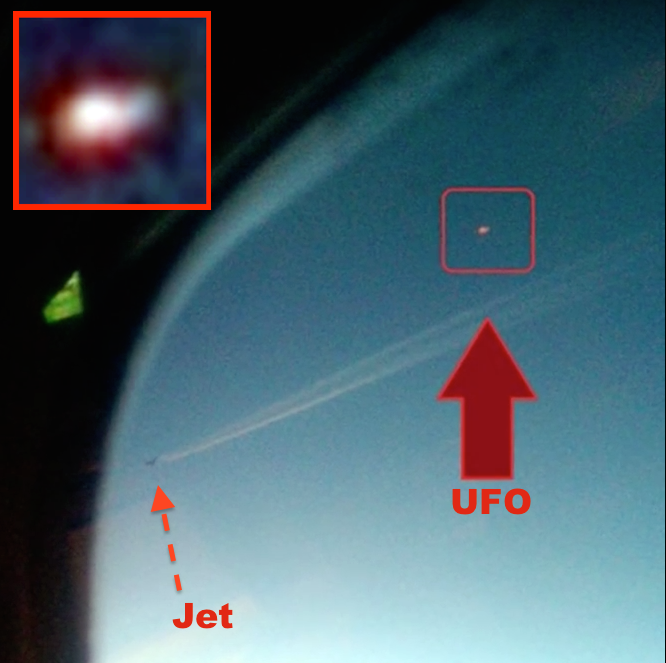 Finally today is January 14, 2016 and I haven’t seen any UFO’s since. 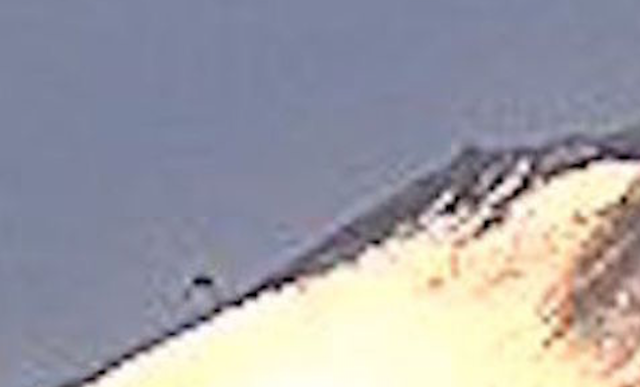 This dark black UFO has been caught hovering over California. The mysterious craft could be seen rotating and making no sound. While attending the Contact in the Desert event I left around 6:15 pm on Sunday night to get some dinner from the local Sonic drive-thru. I ordered my food and paid the woman at the window. 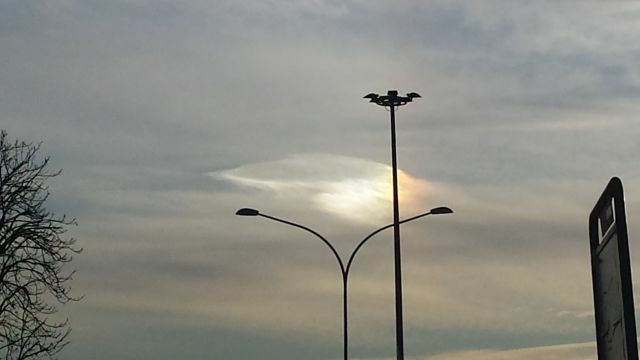 As she handed me my change I noticed this dark ball in the sky straight ahead of me. At this point it was 6:38 pm. Watching it for only a moment I inferred that it wasn't any kind of bird or aircraft that I'm familiar with, so I grabbed my cell phone and immediately started filming. I zoomed in to catch the object on film, and the girl at Sonic opened her window to inform me they were just waiting on my sandwich to be done. I dropped the phone as she talked to me, but focused in on the flying object as soon as she left again. I watched this small spherical object fly just over the power lines, slowly, but consistently. 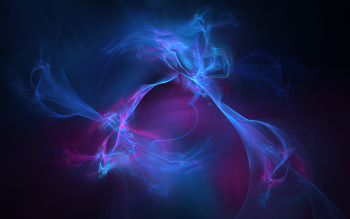 I noticed a slight aura or field of sorts around the craft with my own eyes, and the object seemed to be rotating. When I was watching it I felt a great sense of calm, despite the unknown nature of its appearance. I followed this object with my cell phone just until that Sonic girl handed me my food. After I left the drive thru window I tried finding the object again to record its path some more, and then I noticed it had greatly descended in altitude. When it dropped below where the power lines were, the color of it became camouflaged against the valley's mountain line and I could no longer follow it.